This post talks about building and deploying Windows phone apps using Visual Studio team services. This is part 3 of series of posts. To see how to build iOS & Android apps using VSTS, please see part 1 and 2 of this series. Path to Solution Locate the Windows only solution that has the Windows project and the shared code. If your windows phone app uses sqlite to persist data, then the build process gets slightly tricky. We can easily reference the sqlite package from nuget but windows phone 8.1 does not come pre-installed with the sqlite runtime. We have to package in the necessary sqlite runtime files with our win phone build or the app would not run. One way to achieve this is by installing a visual studio extension and then reference the necessary dlls as described here. That all works fine on the developer machine but not on the build server, not without installing Visual studio on the build server, which is not ideal. An alternate approach is to emulate the SDK folder structure locally in a folder ‘Dependencies’ that lives at the solution level and we check in that folder and its contents to git. The next step is to tell msbuild that this Dependencies folder is a valid location for loading sdk dlls. We do this by adding the following xml in the winphone csproj file (by unloading project and editing). The above xml element can be added after the last existing PropertyGroup xml element in the csproj file. This is how the structure for the Dependencies folder looks like on my dev machine. Doing so will ensure the winphone project can be built locally and on the build server as well. Unfortunately there is no direct support for installing windows phone apps from HockeyApp onto a device, so we need to take a different approach for this. 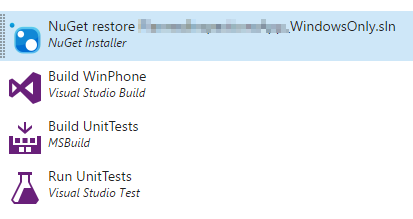 We will upload a win phone app deployment tool (part of windows phone sdk) to our staging area. The testers can grab this tool from the build server/staging area and get the appxupload file from HockeyApp and deploy to device via USB. The tool only has 2 files. These 2 files are zipped up in a folder Dependencies (as mentioned above) and are checked in to the git repo along with the code.